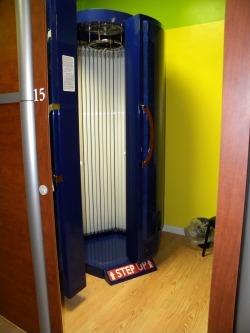 Midlevel tanning at entry level price!!! 28 lamps deliver a great tan time after time. 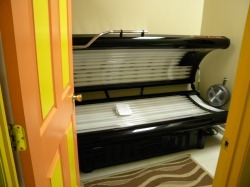 This 20 minute regular bed is equivalent to most other salons mid to upper level beds. 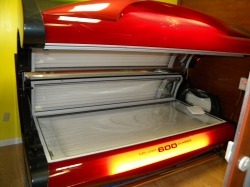 36 lamps and 3 High pressure facials delivers a great tan time after time. External Climate Control: A wide-body jet Stream 550 CFM fan is standard equipment on the 240 series. Fingertip control assures ease of operation for head-to-toe cooling comfort. frequently, supercharge an existing tan, and maintain with less sessions. Once you try the 600 it is hard to go back to any other bed. This bed has 56 Lamps. The elegant 2m™ gives the customer the opportunity for premium vertical tanning. 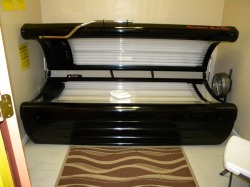 The 50 lamp, 79” long Rave™ 180 APR lamps produce an excellent, all over tan in a 10 minute session. The overall height of the unit is 95", able to tan the tallest. Additionally, 28 cooling fans exhaust the heat and bathe you in a whirlwind of air.